The Samsung Galaxy S6. It lacks IP certification and ruggedness which is what the S6 Active will be launched to take care of. April 10th is the global roll-out date of the Samsung Galaxy S6 and S6 Edge in several markets around the globe. We have information that Kenya will be among those key launch markets of Samsung’s 2015 flagship devices. The Galaxy S6’s base model, the 32 GB version will be available at a market price of Ksh 75,000 while the Galaxy S6 Edge will have the 64 GB version as the base model in this market going for Ksh 90,000. Both devices are clad in Samsung’s new all-metal design that includes a refined fingerprint scanner that will not only allow you to unlock your device or authenticate payments when using Paypal to pay for services online, but will also allow you to log in to your favourite websites as well. There’s also the stunning 577 ppi Quad HD Super AMOLED display that has just been crowned the best of the best by DisplayMate. On top of that, the Galaxy S6 and S6 Edge coming to the Kenyan market will also be 4G-capable. Safaricom recently launched its LTE network and these two devices will work with that right out of the box. It is very interesting to see how keen Samsung is on Kenya and the East African market at large since not only will Kenya be among the first markets to get the new Galaxy smartphones but it will also get the more niche Galaxy S6 Edge. The Galaxy Note Edge never made it to Kenya in an official capacity but its dual-edged sibling will be. That’s a lot of confidence in a market that is still widely regarded as second class and not worthy of attention by other high end brands like Apple which has quite some cult-like fanatic following locally. As was the case with previous flagship Galaxy devices like the Galaxy S4, S5 and the Notes, there will be pre-orders in the run-up to the launch on April 10th. The Galaxy S5 was available for pre-order through carriers Safaricom and Airtel Kenya, phone retailer FoneXpress as well as online retailers Jumia and Duka1. On a global scale, Samsung is reported to have scored well over 20 million pre-orders from its partners in the run-up to the global launch on the 10th. Watch out for these as more often than not, they are juicy and offer some discounts and add-ons like internet data bundles and even wearables rather than waiting for the device to go on sale on the 10th. We’ll update you with information on these pre-orders soon. Sounded like “4G capable” is something that is new to Galaxy devices though its been available on them for a long while now..
It’s been available. 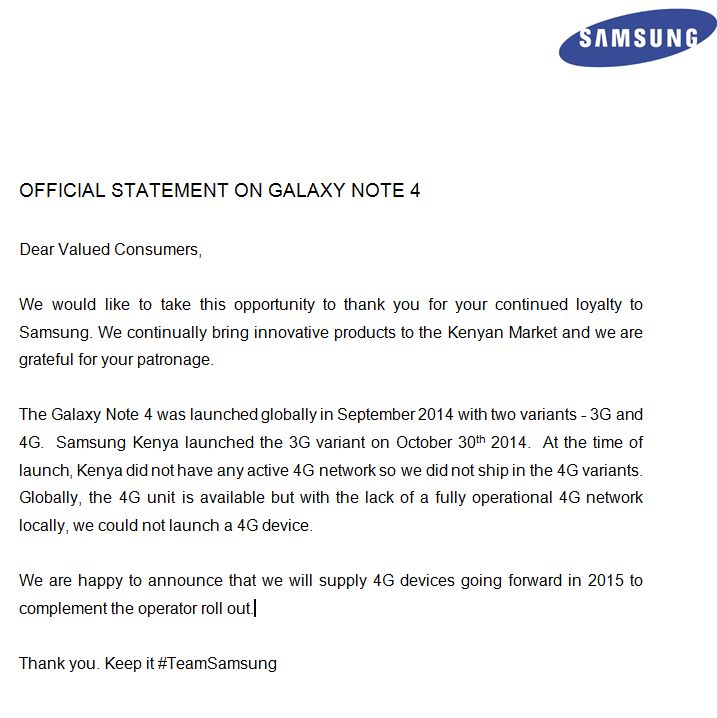 But Samsung wasn’t selling 4G phones to markets where there was no 4G. Kenya recently launched 4G, so it’s a thing here.